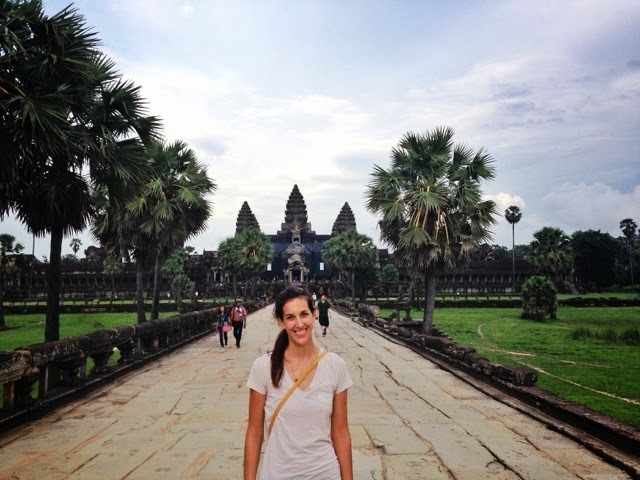 Angkor Wat was easily one of the top highlights from our entire 7-month journey to Southeast Asia. This vast, never ending collection of ancient temples is fun, mesmerizing, inspiring, and educational. It's an amazing experience for people of all ages and a very worthy bucket-list adventure. 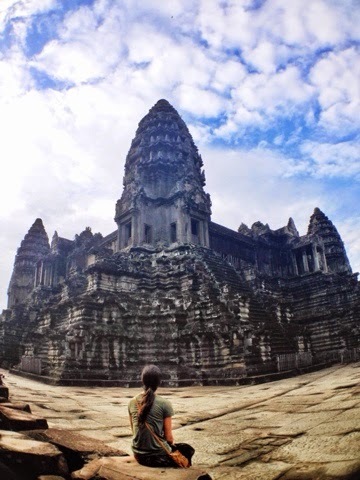 There were a few things I learned while visiting that can help make anyone's experience more rich and enjoyable so I'd like to share my 5 tips for visiting Angkor Wat. 1. Dress Modestly. 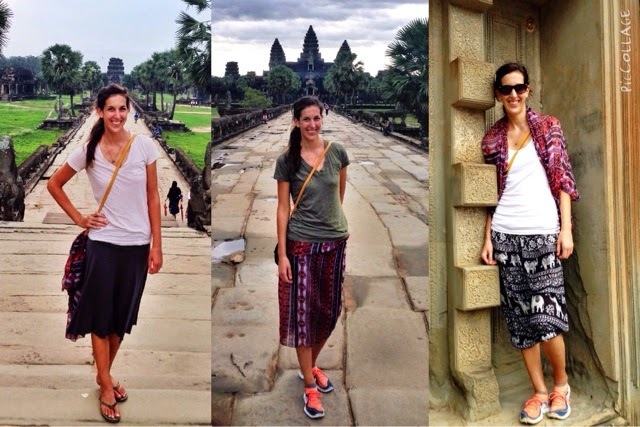 This may be obvious to some people but you need to dress modestly while visiting the temples, meaning no exposed knees or shoulders. Prior to going, I swear I had seen photos of people exploring these temples in shorts and tank tops due to the heat. While yes, it is hot in Cambodia, these are holy temples and it is important to respect their sanctity with appropriate dress and action. Furthermore, you may be prohibited from entering certain temples if you're not dressed appropriately as many have guards monitoring this very thing. So bust out your knee-length skirts and short sleeve tees for this one and if all else fails, you can always buy some elephant pants! 2. You can get 50% off your meals and drinks at restaurants within the complex. One thing you'll learn quickly about Cambodia is that meals are really cheap, about $1-3 in the city of Siem Reap. Within the Angkor Wat complex, however, these prices double (at least). I was shocked when on our first day at the complex, my husband started bargaining with the restaurant owners at lunchtime. Even more shocking was how quickly they dropped their prices! At first I felt guilty about this but once I realized how low the cost of living is for these people and that they are still making a big profit when you eat at their restaurant (as opposed to one of the 20 different restaurants right next to them), the guilt quickly faded. 3. Take time to sit at each of the temples. These are amazing man made wonders and you'll want to remember how you felt at each of the temples. When you get home, people will ask you about your time here and you want to have a good answer, so take the time you need to reflect on your thoughts and feelings at the temples. It's easy to get caught up in the rush if trying to see all the temples and going through the motions (especially if you have a tour guide with you). Avoid the temptation to squeeze in one more temple and instead, take time to wander as slowly as you'd like and think about where you are. It's one of the coolest places you'll ever be so make it last. 4. Don't buy anything from the young children. 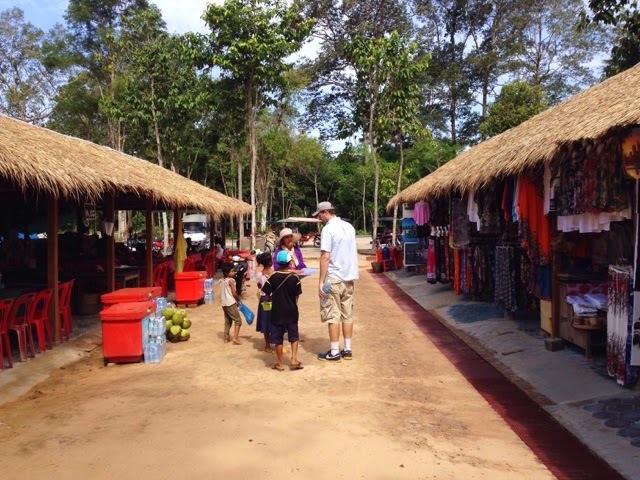 There will be many locals outside all the temples trying to sell you trinkets and goods. Buy as much as you want from the adults but avoid buying from children, as cute as they may be (and as low of a price as they may offer you). Interact with them, ask them how high they can count, laugh with them but don't give them any money. Parents should work. Children should play (and go to school). 5. Visit the incredible tree at Ta Som. There is a lesser known temple called Ta Som that is well worth making a visit to if for nothing else but the tree at the back entrance. 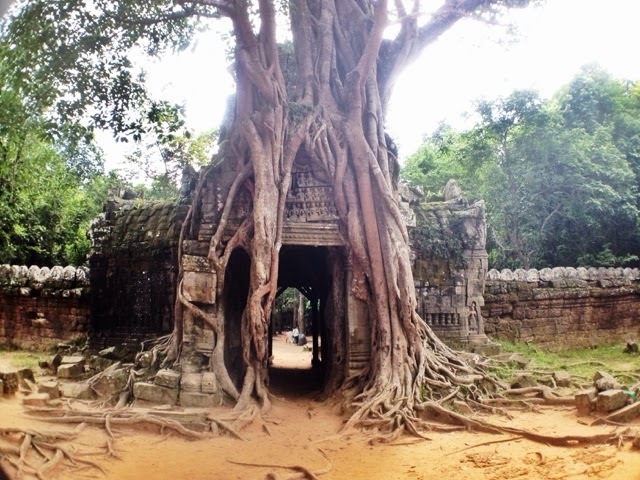 Many people will tell you that Ta Prohm (the Angelina Jolie temple) is the best example of trees fighting against stone. Ta Prohm is the biggest, but the back entrance of Ta Som is the best. My favorite spot in the whole complex. On February 23, 2015, the best thing happened to us. Our daughter was born! In the last year, we've done and seen some amazing things, but all of that pales in comparison to the joy our Petra Elizabeth brings us everyday. It's incredible how something so small can bring so much happiness. 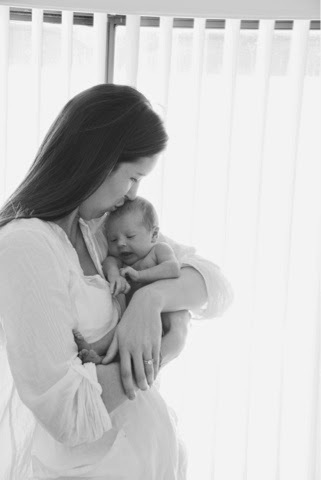 She's currently only 11 pounds and fits easily in our lap, but the fact that she is a living, breathing creature that was created from nothing is just incredible. She blows my mind every day by simply being. And the sweetness of holding her while she sleeps on my chest? Don't get me started. I don't think there's a better high in the world. 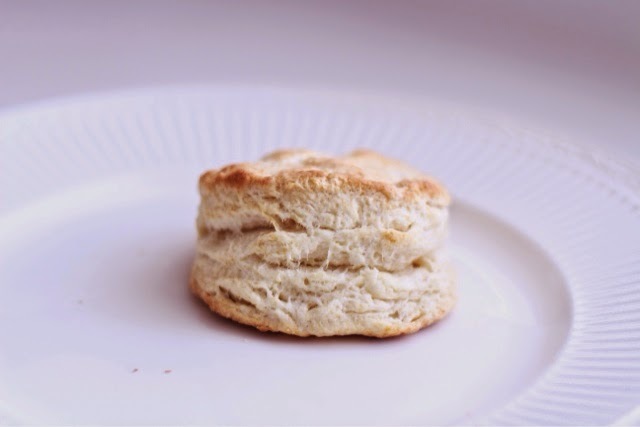 I've always loved biscuits. There's something about them that feels so right--like a warm hug on a cold day. Sadly, I've always believed that biscuits are also really difficult to make. Well, last Saturday was a glorious day because I was proven wrong! 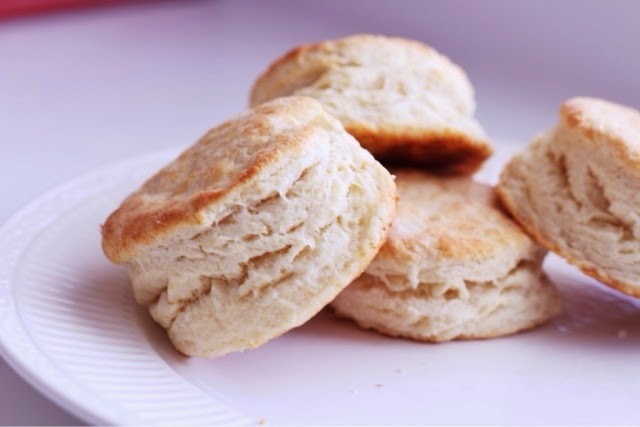 Delicious biscuits can actually be quite easy. As I pulled these out of the oven within about 20 minutes of starting the recipe, I exclaimed to myself, "Well, call me Betty Crocker!" That is how I felt. 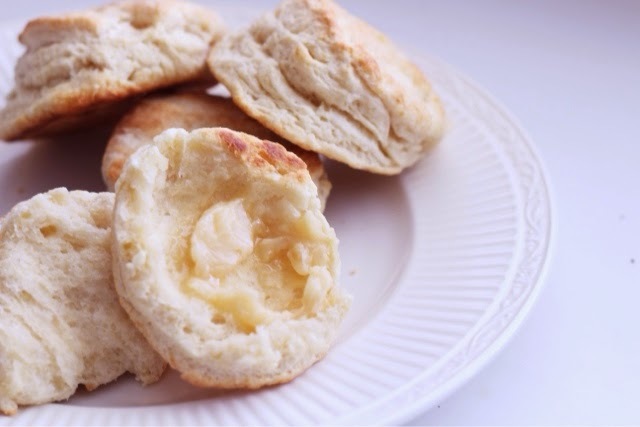 The texture, the taste, and the simplicity...these are perfect. *To make buttermilk, pour 2 teaspoons of vinegar in a measuring cup, then add milk until you reach 2/3 cup line. Let sit for five minutes before adding to ingredients. Preheat oven to 450 degrees. In a large bowl, mix flour, baking powder, cream of tartar, salt, and baking soda. Next, cut chilled butter into dry ingredients using a pastry cutter (or a fork if you're like me and don't own a pastry cutter) until mixture is crumbly. Then add buttermilk and mix with a fork. Knead the dough a few times on a lightly floured surface. Roll or press dough to about 1/2 inch thick. Then using a circle cookie cutter (or glass, or measuring cup--whatever you can get your hands on that is the shape of a circle), cut into circles and place on an ungreased cookie sheet. Bake until fluffy and slightly browned, about 10-12 minutes. **Serving Suggestion: Serve with honey butter. 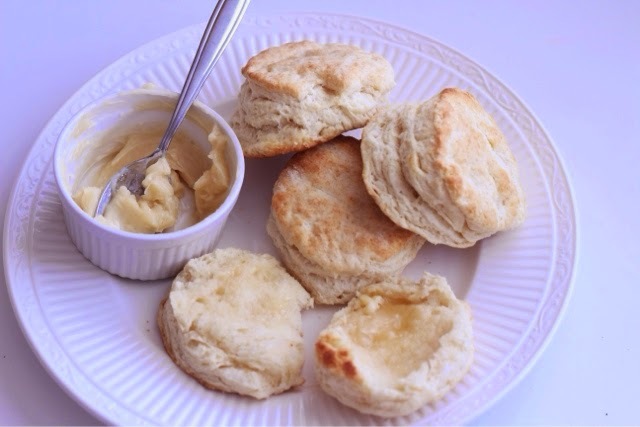 Simply mix equal parts honey and softened butter, then spread on biscuits. Enjoy.